Living in Delaware, I find myself craving classical music. The Delaware Chamber Music Festival (DCMF) has been satisfying the community's cravings for 27 years and is a staple of the local classical musical diet. Even on a beautiful Father's Day afternoon, the concert hall at The Music School of Delaware was nearly full. 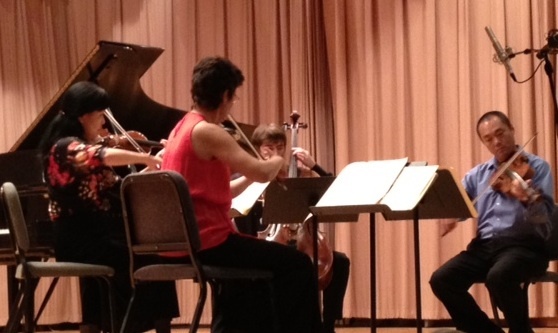 The quartet: Barbara Govatos, violin, Hirono Oka, violin, Burchard Tang, viola and Clancy Newman, cello. Sylvia Glickman's Carved in Courage, arranged for string quartet by Tony Finno, is part of a trilogy Glickman dedicated to the holocaust. Barbara Govatos, DCMF musical director, explained the significance of the work and its references to the Danish resistance movement during WWII. The movements---Premonitions, Preparations-Frøde Jacobsen-Resistence Leader, Krystalgade Synagogue and Dr. Køster of Bispebjerg Hospital, Rescue by the Sea-Jens Møller, fisherman/rescuer and The Afterward---each conveyed an important emotional and musical message, with the Danish National Anthem triumphantly finding its way in at the very end. Lyrical and full of passion, Glickman's work was beautifully played. My grandfather, who had been part of the Danish resistance movement, was captured, imprisoned and tortured by the Nazis. I know he would have been deeply moved by this tribute. As guest artist, pianist Julie Nishimura performed in Wolfgang Amadeus Mozart's Piano Trio in B flat major, K. 502. Nishimura's beautiful playing was balanced perfectly with the lovely sounds produced by violinist Barbara Govatos and cellist Clancy Newman. Mozart always delights with his usually light, joyous themes and brief departures to more pensive territory. Ending the program was Claude Debussy's String Quartet in G minor. Though Debussy was born 150 years ago, his quartet seems to structurally, harmonically and melodically belong to a later era. The players exploited every dynamic and nuance of Debussy's often brooding music. 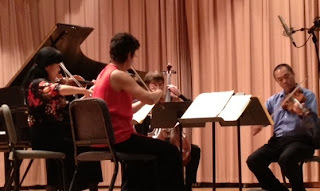 Be sure to catch The Delaware Chamber Music Festival's last concerts of the season on June 22, 2012 at 7:30 pm and June 24, 2012 at 3:00 pm, also at The Music School of Delaware. Hi - Angie here from the Delaware Chamber Music Festival. Please note that our last concert is June 24th - so we have two more remaining! Thanks Angie! I have fixed it. Take Your Hair-Hopper Friends to See Hairspray! Wilmington Drama League Brings Back Birdie! The Rocky Horror Show ROCKS Newark!